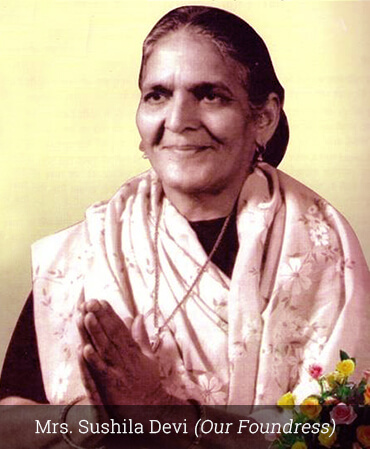 Mrs. Sushila Devi known as ‘ Mother’ was born on 15th July 1910 in Lahore, which was part of undivided India. Her father was an accountant in the British administration. Her parents believed in the value education so they provided good education to all their nine children including girls, which was not the norm at that time. ‘Mother’ went to Kinnaird College in Lahore. In 1931 Sushila Devi was married to Sri Umrao Singh Mathur, also from Lahore. In 1942 Umrao Singh was commissioned as an army officer in the British Indian Army and fought on the Burma front. After his retirement in 1955 Col. Umrao Singh built his family home in Mumford Ganj Prayagraj. Col. Umrao Singh died in 1962. By that time all the children of Umrao Singh and Sushila Devi were well established in America and Canada.